The adventures of Dante Wilson and his parents. Things are feeling different to me now. Dante has been with us for more than 10 years, and there is no longer a crowd of people seeking updates on him. I have settled well into being a parent — in fact for me it’s gotten easier and easier as time has gone on — so I no longer feel the need for a personal outlet very much. And while it’s great to have a record of his childhood, I find that lately most of what I’m writing about is favorite toys, or doings at school, or mutual adventures. This is all cool, of course, but it doesn’t feel quite so essential. Moreover, as I wrote in that prior post, Dante is more and more occupying his own place in the world, and it feels less and less appropriate for me to write anything on his behalf. If he has something to communicate, he can write it himself now. And if I have something I want to write about for my own sake as a parent, I have to be careful to protect both his privacy and my own. Hence the password-protected posts, which have always felt a bit kludgey to me. Consequently, I think I’m going to be tapering off my commitment to this blog. It may not be incredibly apparent, but I’ve maintained a deal with myself which dictates that I must post here on a regular basis. I think it’s time to let that deal expire. That doesn’t mean I’ll never post here again — if the occasion arises and it feels right, I’ll gladly record more of our adventures here. And I’ll probably still do the annual Facebook post, as long as that remains a relevant thing. But I’m going to let go of my personal sense of obligation about writing here. For those of you who have read this stuff, I am grateful for and honored by your attention. Don’t hesitate to email me (or comment on one of these entries) if you’re hungry for an update, and I’ll write one. I possibly may start a more private blog in the future about parenting, and make its readership invitation-only. If I do that, I’ll likely move all the protected posts there, since as Dante points out, it’s weird to have entries on his blog that he himself isn’t allowed to read. Until next time, so long, and thanks for sharing the ride. No, this one isn’t about school, though our state is certainly fond of standardized tests right now. Rather, it’s about the next step in Dante’s Portal journey, which is fully underway. 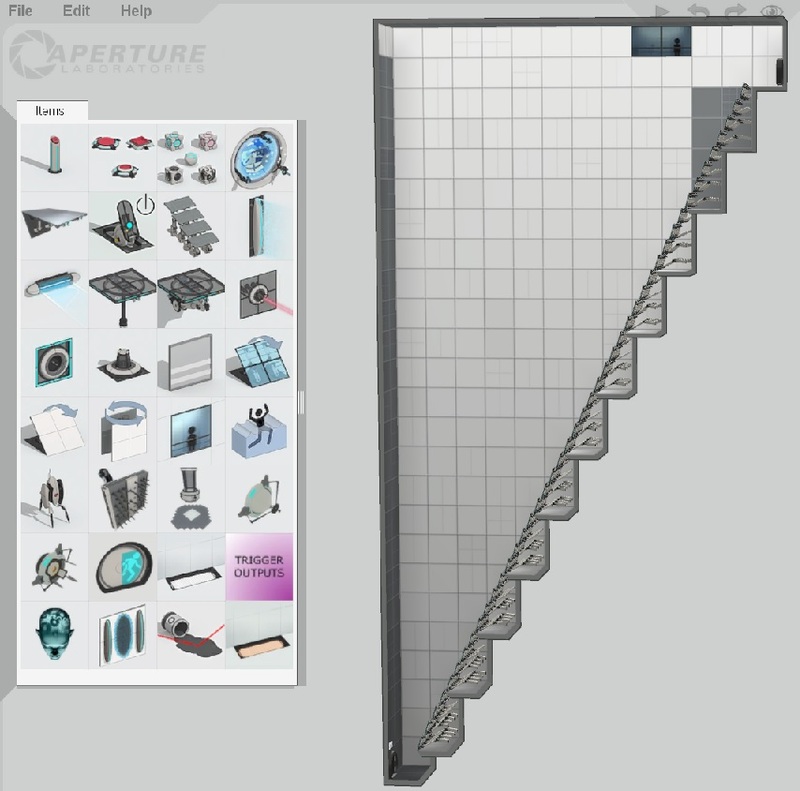 Having solved Portal, then Portal 2, and finally the co-op levels in Portal 2, it appeared that there were no more Portal levels to solve. Not so! Valve, the makers of the Portal games, enhanced the game after it was released with something called the Perpetual Testing Initiative. What’s that mean? Well, the conceit of the Portal games is that the player is being tested, by a company named Aperture, in the name of Science, with a capital S. Each test is more difficult and deadly than the last, and finally at the end the player character breaks out of the testing facility, into something like freedom. Thus end the tests. But the story behind the PeTI (as the Perpetual Testing Initiative is affectionately known) is that Aperture discovers a way of leveraging the multiverse, tricking an infinite number of Apertures in parallel universes into creating new test chambers. What is this, really? It’s a level editor! In other words, a puzzle maker’s toolkit, allowing users to create their very own levels, and publish them on the Internet. This has resulted in two very cool things. First, there’s an endless stream of new Portal puzzles to solve, and a rating system in the publication mechanism makes it easy to find good ones. Second, and even cooler, Dante can have endless fun designing crazy levels for the game. Dante has loved game level editors for years, and the PeTI is the most awesome level editor he’s ever used. So now he splits his portal time between playing levels other people have made, and making new environments for he and I and his babysitter Rhianna to play in. He’s gotten quite skilled at solving Portal puzzles, but my observation is that making new puzzles isn’t his primary interest in the creator. Rather, what he loves most is novelty. He spent some time trying out every possible element in the puzzle editor, and configuring them in the various ways they can be configured. Once he had squeezed all the juice out of that, he went looking for more, since the editor doesn’t contain all the elements that show up in the game itself. As you might expect, there’s a Portal 2 modding community, and it’s still pretty active even though the game is several years old. That community has put together some packages which add a whole lot of new elements to the PeTI, and which allow the designer to select from a whole bunch of different “palettes”, essentially themed sets of skins for the various elements. It’s a candy store, though some of it is pretty experimental candy, that may not taste the way it should. There are a number of pieces in the biggest, most recent package, which just don’t work quite the way they should. Dante’s attempts to troubleshoot those have led us from PeTI to the Hammer editor, which is the tool that Valve developers themselves use to create levels, objects, and scripts in the game engine. This is the deep end of the pool, definitely. Still, thanks to some helpful tutorials, we’ve managed to scrape through a few steps, manipulating maps in Hammer, testing the changes, and then iterating through that cycle until we burn out. We’re still a long way from fixing the broken pieces, but we’re learning an awful lot in the process. Wheeee! – A level in which he cleverly strung together a series of flipped staircases, to make a long slide from the entrance door to the exit door. Faith In Plates – In which those springy plates are spread out all over the room, bouncing you from one to the next. …and lots of others. Many of his levels aren’t meant so much to provide a fun experience for a player, but rather to let him play with all the nifty toys in the toybox, finding out what they do and what their limits are. Still, there’s a kooky pleasure to playing through one of his nutso levels. Occasionally he’ll fetch me so I can experience his latest wacky creation — tonight it was the slide one. It’s great fun to see him putting these environments together, and I love it that Valve and the hobbyist community have made such a robust and fascinating tool for doing so. Just before Christmas in 2014, my family and I awoke to a strange and disturbing sight. On our kitchen floor, extending from the front of our dishwasher, was what I guess I’d call a pond. It seems that the dishwasher (which runs overnight) had flooded, and the resulting water had covered our floor and hung out there all night. So, much of that day was spent soaking up water, googling “how to fix leaky dishwasher” articles, trying to follow the advice in said articles, and having that advice not result in a fixed dishwasher. We did learn enough to determine that it was time to get a new one. Our old one was original to the house (so 13 years old now), and it didn’t make a lot of sense to pour significant resources into fixing it. So, hey, we got a new dishwasher, after wrangling a bit with Sears on the delivery time. There was a corollary effect, here. The planks of our wooden kitchen floor, formerly nice and flat, had been turned by the standing water into little ocean waves, so that you’d get kind of a corduroy feeling as you ran your feet across them. Well, a new dishwasher is one thing, but a new floor is a much bigger proposition. So, we called our insurance company. They established that yep, that loss was covered (after our hefty deductible, mind you), and that fixing it would be a 3-4 day endeavor, which we could choose to do anytime in 2015 (basically we had a year from the time we made the claim.) Moreover, during that time we wouldn’t really be able to live in our house, due to everything being ripped up, replaced, and then coated in heavy chemical sealants. Because of this, they offered to pay hotel and cat boarding costs for us during the procedure. There were a couple of ways we could go about this. One, they could find us a place to stay nearby, make the reservation, pay it off, etc. — basically take care of everything so that we’d just be able to go. Two, they could determine how much the place they’d find would cost, and then let us make our own arrangements, as long as we kept under that number (or agreed to cover the difference.) We opted for the second choice, because we are somewhat finicky people, and wanted to have control over what kind of place we’d spend a week in. As it turned out, the number that they named allowed us a fair amount of latitude, and they didn’t care where we stayed since it wouldn’t affect their payout. So we found a nice condo via VRBO, and in the first week of July, we took a vacation in Keystone, Colorado! It was a lovely trip – a great balance of resting and activity. Resting time meant reading: a temporary subscription to Marvel Unlimited for me, Patricia McKillip’s Moon-Flash for Laura, and various Star Wars, Dork Diaries, and Ken Jennings Junior Genius Guides for Dante. Dante and I also spent time with a vintage IF game called The Pawn. I found it pretty frustrating, and after a while switched to walkthrough mode, but Dante was fascinated with it, and had a great time wandering around and trying different commands, as well as solving the occasional puzzle. 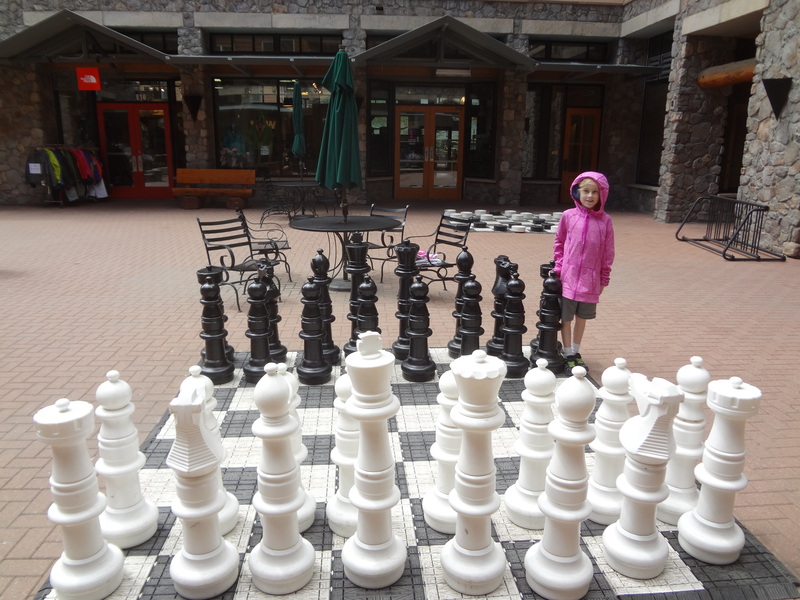 There was a giant chessboard in the little village (meaning stores and restaurants) outside our condo. 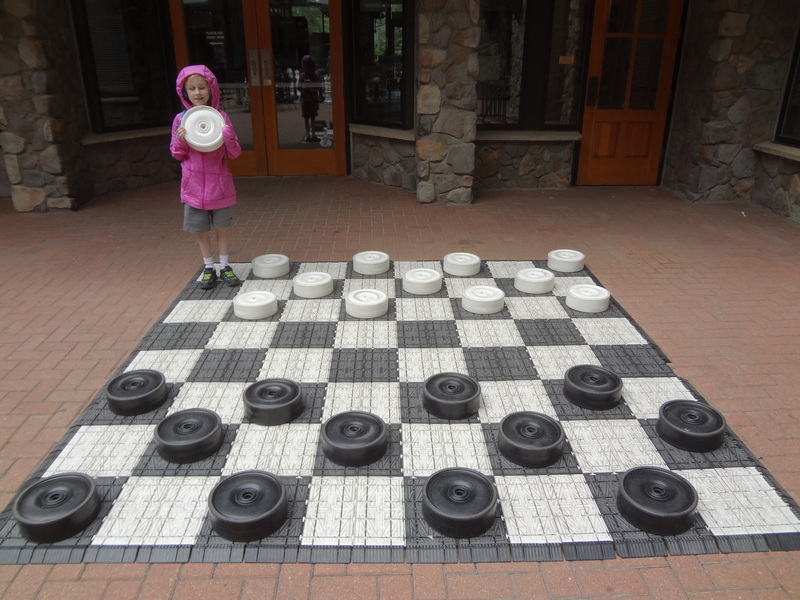 Dante and I played a game, and I emerged victorious, somewhat salving my ego after the massive trouncing I received on the nearby giant checkerboard. 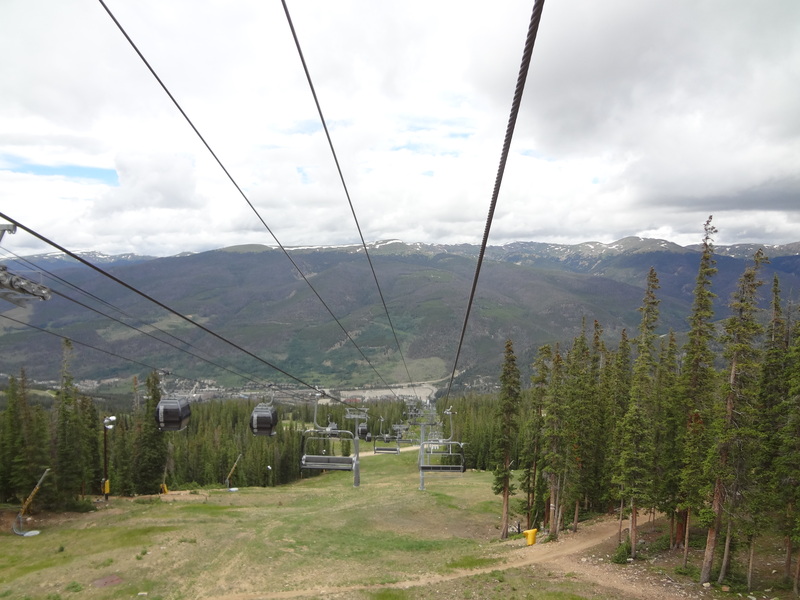 The three of us rode a ski lift up and down the mountain a few times. 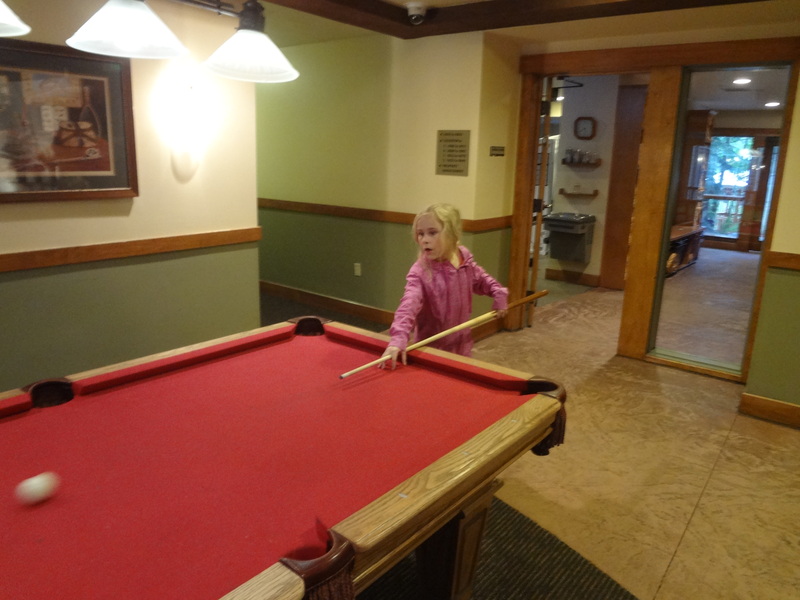 The place we were staying had a cool pool table in a common area, so Dante got his first billiards experience. 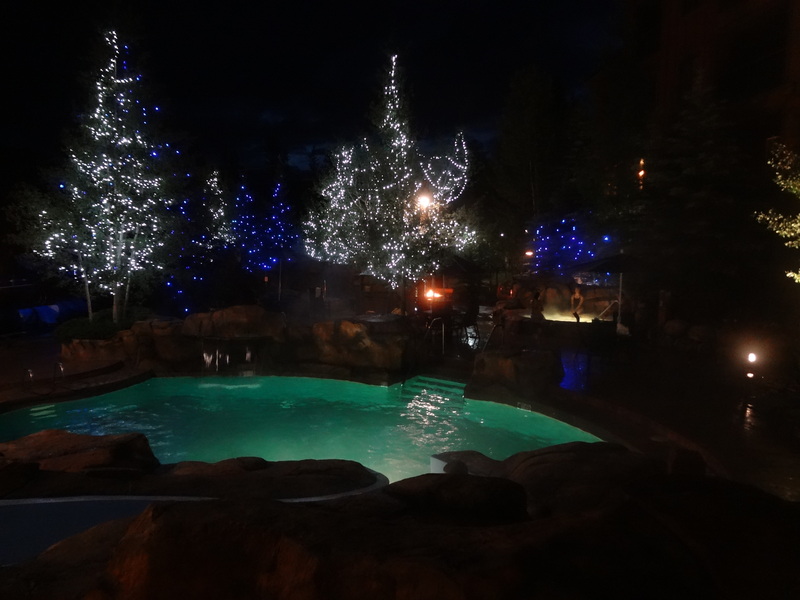 They also had an awesome actual pool, complete with hot tubs. It was quite magical at night, when the lights came on. 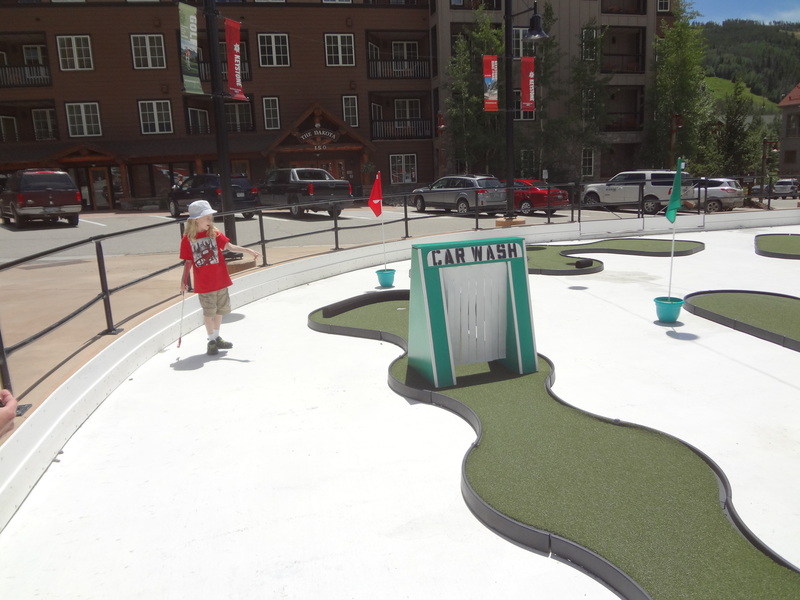 We also had a mini-golf outing, at the kind of mini-golf course that can be loaded in and out of a big truck. 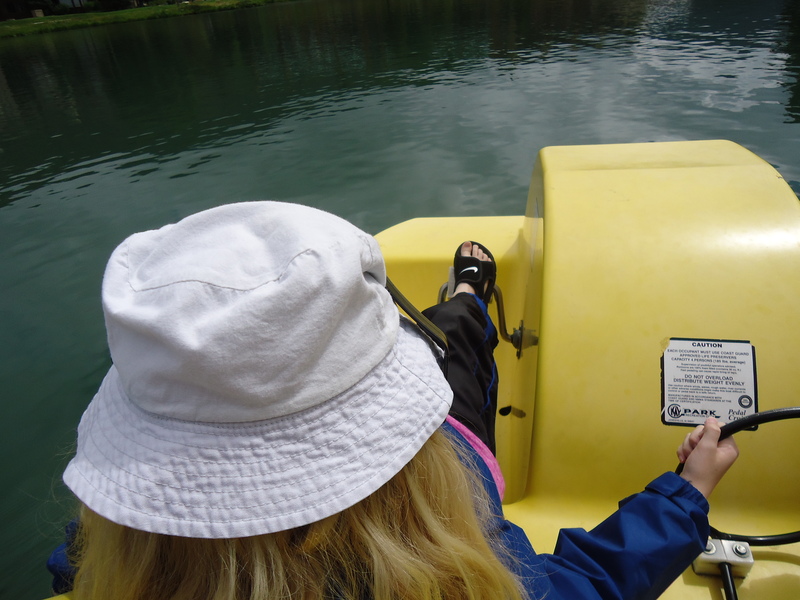 There’s a little lake in one area of Keystone (just a bit bigger than the one in front of our dishwasher that morning), and we rented a paddleboat to ride on it. Laura also took a morning and rented a kayak to explore the much larger Lake Dillon, down the road from Keystone. We returned home to a flat floor and a strong smell. The overall experience with contractors and insurance was fairly frustrating, but it sure was nice to be able to all get away together, and not have to pay for lodging! Say, it’s just about summer, isn’t it? I guess that means it’s time once again for the annual Facebook recap! November 29: Gamer friends: Dante and I are having a blast with various Lego video games — these are great because they have cooperative play modes built in, so we can play together without having to take turns or compete. Any other recommendations for other cooperative games aimed at the 8-12 age bracket? (i.e. nothing too scary or violent.) We use the PC rather than a console, but do have USB game controllers. [Paul O’Brian] For some reason he’s never really dug minecraft. It feels too violent to him. Not sure the difference between its violence and Legos flying apart, but he sees it that way. January 14: Dante argues with the classic hits. BEATLES: Every little thing she does, she does for me, yeah! DANTE: Really? What about breathing? What about sleeping? ME: Yeah, I guess when you come down to it she’s got to be doing some things for herself. [Duncan Stevens] Next you’ll be telling me every little thing she does *isn’t* magic. [Paul O’Brian] Nah, the things she does for herself can still be magic. Maybe even more so. [Duncan Stevens] I wonder if he’ll ask you why the movement you need is on your shoulder. [Paul O’Brian] I’ve always wondered that myself. ME: What do you want to say to granddad? DANTE: Happy birthday granddad! I’m glad you’re 70! DANTE: And, I hope you like being old! ME: Uh, let’s workshop that a little bit. scored points for how old you were, you would totally win! ME: Maybe let’s take the emphasis off the “you are so old” stuff. JIM CROCE: Like the pine trees lining the winding road, I got a name. I got a name. DANTE: Well, of course. Almost everybody has a name. CHRISTINE MCVIE: I never did believe in the ways of magic. DANTE: Me neither. Or the ways of Santa. [Jennifer Nelson] Is he beginning to wonder why? [Paul O’Brian] Nope, he’s pretty certain. CLASH: If I go there will be trouble, and if I stay it will be double. DANTE: Then go. Because it’s half the trouble. [Duncan Stevens] Also, “if you say that you are mine/I’ll be here till the end of time.” What if you get tired of him later? Better not say it. [Jennifer Nelson] I completely agree with Dante on this one. The answer is obvious. KILLERS: Are we human, or are we dancer? [Jenny O’Brian] It just occurred to me that maybe it’s Dancer the reindeer that’s in question here? Back in Februrary, I mentioned that Dante was playing Portal 2. Well, a few weeks ago, he finished it. Once again, he did so without help from me, which was so cool to watch. I continue to be surprised at how difficult I find it to allow him to be stuck and frustrated, but instead of helping him solve the puzzle, I work on helping him manage the emotional component of stuckness, so that he can recognize when he needs a break. As a result, he sometimes powered through parts of the game, and sometimes went at it in fits and starts. Also, there are places where the jeopardy factor gets pretty cranked up, including a chapter titled “The Part Where He Kills You.” He knew about this chapter from a Steam achievement of the same name. Spoiler alert: the chapter is somewhat misleadingly titled. So as he approached that part, he would play for a few minutes and then quit out of nervousness. Eventually, though, he got through it, and beat the game. Now, I’d finished both Portal and its sequel a couple of years ago. I loved them, and it was fun to re-experience them through Dante’s eyes. However, there was a part I’d never gotten to play. See, Portal 2 has a cooperative mode, with puzzles requiring participation from two players. You play two different cute little robots, one named Atlas and the other named P-Body, and solve a bunch of portal-themed puzzles with them. I’m a solo videogamer for the most part, and I have no interest in partnering up with some random from the Internet. I know one other person who plays the game, but my schedule is restricted and it’s hard for me to commit solidly to game time, so I didn’t feel right trying to arrange shaky late-night gaming sessions. Plus, it seemed like we’d need some kind of voice chat to make the cooperation work well, and I’m not equipped for that. However, once Dante finished Portal 2, not only did I know another player, I actually live with that player! There was an obstacle for a while, in that the mode was originally set up to be played online, by multiple owners of the game. I only own one copy, and it seemed silly to buy another one just to play the co-op levels. However, a little research revealed that the game had been patched to support splitscreen co-op play on the same computer, as long as a game controller is plugged in. I’d gotten game controllers so Dante and I could play Lego games cooperatively, and obtained a monitor big enough for splitscreen last year. We were in business! Now we’re playing levels that are new to both of us, and having a blast. Dante is a great partner. I’m no longer holding back — I’m working just as hard at solving the puzzles as he is, and both of us are contributing. I absolutely love it when we’re stuck and he gets us unstuck. (Of course, I’m pretty satisfied being the unsticker as well.) Whoever has the current idea will direct the other, and we’re making it through together. A couple of years ago, Dante followed one of his closest friends into a Pokémon infatuation. Now she’s moved on to something new, and he’s moving with her: yes, quite suddenly, it is all about My Little Pony here. There have been little rumblings for a few months now, but several weeks ago his interest suddenly skyrocketed, for reasons I’m not sure of. He sought out some YouTube videos of all the songs from the first several seasons of the show, and watched it over and over again. Based solely on this video, he extrapolated a bunch of “facts” about the show and the characters — some correct and some not. Then he taught us these facts, and hailing as we do from a non-pony country, we learned them. Only slowly, over time, did I come to realize how much of this information he’d simply made up on his own. However, once I understood what was going on, I was rather perturbed. I really do not want Dante to adopt the habit of inventing his own information and then acting as if it is true, without bothering to find out the real deal for himself. I want our family to live in the reality-based community, thanks very much. Lucky for me, the show is on Netflix, which allows us to catch up with who everybody actually is, and why they do what they do. Now Dante can rearrange his conjectures to match the real story. We’ve made a deal to try to watch at least one episode a day, though once he figured out how to use Netflix he started zooming ahead of me. That’s fine — I don’t mind catching up. Even luckier for me, the show is actually pretty fun, as many a brony could testify. It’s one of those shows where the main content is for kids, but there’s enough in there for adults that we can really enjoy sharing it together. The comedy, especially, is quite well done, and they sometimes make the occasional reference that would go well over a kid’s head but be caught by an appreciative parent. For instance, Pinkie Pie’s gait as she trails after a fellow pony is pure Pepe Le Pew. So now I’m learning all about Rainbow Dash, Rarity, Twilight Sparkle, Princess Celestia, and the rest. Dante is learning how to sew, because Rarity sews. He’s making rainbow-themed art at school. Celestia is the background on his computer account. And we’re all learning a lot of valuable lessons about the magic of friendship. So, there are a couple of things that set up this story. First, let me tell you about the Dramatic Action Music CD. In supplying Dante with music for his room, I’d made him a couple of mix CDs of classical music, pulled from a collection of classical music used in the movies. He listens to these a lot, and has definitely found gravitated towards certain tracks. Recently, as part of his fascination with Nero, he decided he wanted to make a new mix. He pulled his favorite tracks from the classical mixes, a selection of John Williams’ Star Wars music, and, for some reason, “Computer Assisted Design” by They Might Be Giants. Once he’d crafted the mix, he called it “Dramatic Action Music”, we burned it to a CD, and he’s been listening to it ever since. So we ordered the kit, endured a couple of days of “Is it here yet is it here yet is it here yet is it here yet?”, and finally it arrived. Dante built the clinic and integrated it into the Lego utopia he’d already built. This gave the cat the opportunity to get stuck up in a tree, and gave Mia the opportunity to come to the rescue. While this play was happening, the Dramatic Action Music CD was on in the background, and the music it happened to be playing was the Hallelujah Chorus from Handel’s Messiah. This juxtaposition tickled Dante, and he told the story for several days of how Mia rescued the kitty to a chorus of hallelujahs. A while later, he got curious about the song, and googled “Hallelujah lyrics.” What he didn’t realize is that when you google “Hallelujah lyrics”, you don’t get Handel’s Messiah. Instead you get Leonard Cohen’s oft–covered song “Hallelujah.” He didn’t know the difference, and anyway the difference likely wouldn’t have made a difference to him. He was inspired by reading Cohen’s lyrics, and decided to adapt a version about Mia, the Lego veterinarian. But you don’t really care for meds, do you? mia instructing the baffled aunt sophie. You say x-rays, dear missy? And she healed the puppy completely. every one that mia speaks. and I called the heartlake vet. For Christmas, I was seriously thrilled to find a Lego cat set for him. (I mean really! A Lego cat! What could be more perfect for this boy?) I also ordered a pound of random Legos from one of those eBay sellers who offers random Legos by the pound. On top of that, my friend Tashi got him a set with the Ice Cream Machine from the completely awesome, totally-shoulda-been-nominated-for-Best-Picture Lego Movie. Oh, and Santa also brought the videogame version of the Lego movie. When he got all these new Legos, he decided he wanted to mix them all together in a big box after following a couple of the recipes. 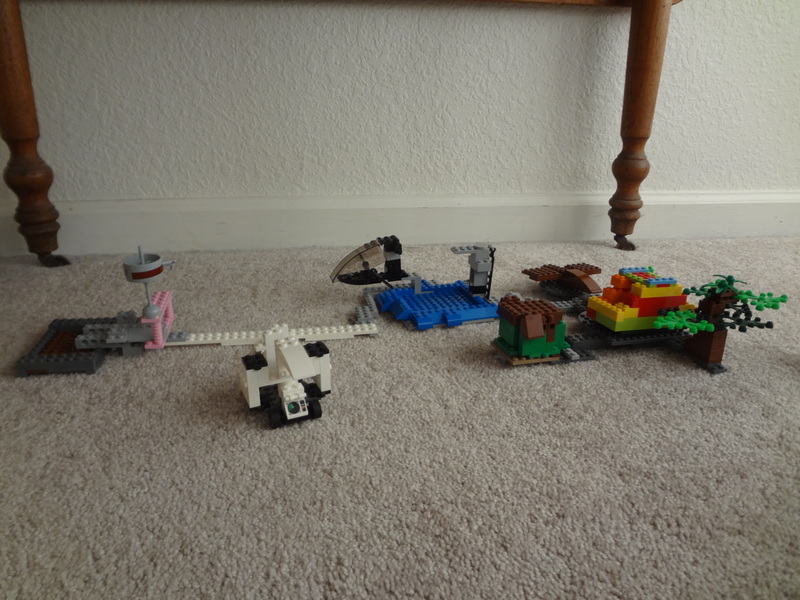 He used the melange to make a bunch of his own creations, which he called “The Dragonfighters of England.” These are various brave Lego people, with various brave Lego ships, dedicated to battling the dragon who lives in our house. The dragon is furry, and cute, and fierce, and meows a lot. He is far more powerful than the Dragonfighters, so the merest sniff blows them away. Quick aside: Here’s how Nimbus earned his reputation as a dragon. One day Laura brought home a bag of marbles as a gift for Dante, and for whatever reason, the marbles were marketed as “Henry Hobbit” marbles. Whenever one of these would drop on the ground, Nimbus would run up from wherever he was and start batting the marble and chasing it around. As a result, Dante nicknamed him “Smaug”, and he’s been a huge hobbit-chasing enthusiast ever since then. Lucky for the hobbits, they’ve figured how how to find safe haven beneath the oven. Anyway, after the Dragonfighters’ day was done, they were disassembled, and Dante decided to sort all his Legos by color, so that he could make some more recipes. He did that (made the cat), and this week has been building a “Lego utopia” for his people – basically a campground and a playground, along with some vehicles. There’s a tent, a tree, a grill, a pool, a boat, a slide, a sandbox, etc. Laura and I have been participating on some of these, but the passion is Dante’s all the way. The “making things with computers” energy is going into mini-movies right now. The Lego video game (and movie) has a concept called “Master Builders”, which basically means that a character gathers up a bunch of Legos into a whirlwind, then builds something cool at super-speed. Dante got interested in reproducing this effect on video with himself as the builder, so he explored a couple of ways to do that. First, he discovered a time-lapse feature on our tablet, with an adjustable interval. 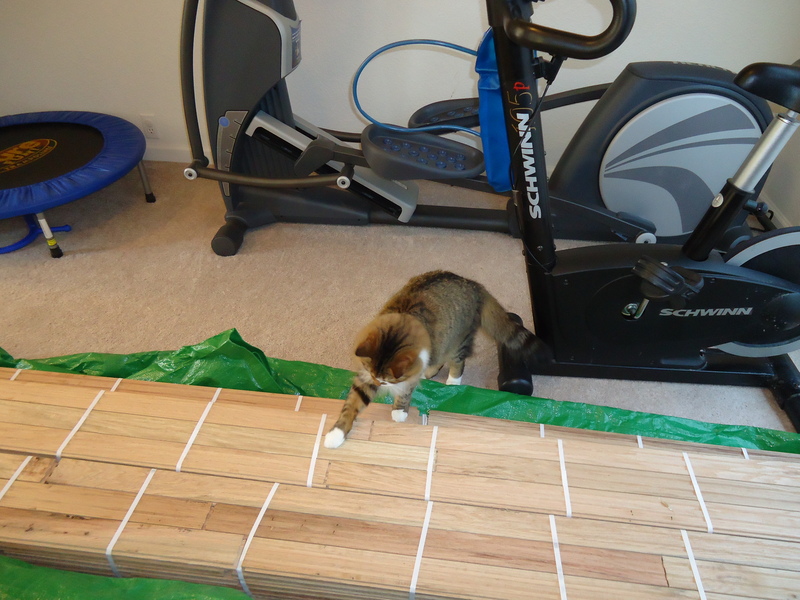 It works very well to create the super-fast building effect, and he’s also taken various movies of other things too – the gathering night, parts of our house throughout the day, and of course the cat. Then he started investigating a program called Nero, which I mainly bought for CD burning long ago, but which also has a video editing component. That video editor has some speed variation effects, which can slow down or speed up a piece of video up to 10x. He tried the high speed for master-build videos, but it didn’t come out as well as the time-lapse. However, the slow speed has proven to be lots of fun. He’s made slow motion videos of Lego contraptions exploding, balls flying through the air, and of course, the cat. Dante finished Portal! And when I say Dante finished it, I mean that I gave no answers, no walkthroughs, no hints. I sometimes sat in the driver’s seat, especially for those puzzles which required quick reflexes, but at all points I asked Dante what to do, and he directed me. I was the instrument at times, but the exploration, examination, and experimentation was all his. It was very cool to see. Sometimes he could solve a puzzle straight away. Sometimes he’d bang away at a puzzle for a while and then take a break from the game, only to come back later and very quickly see what needs to be done. Sometimes he’d try a few things fruitlessly, then say, “Ooh, I have an idea.” I think that was my favorite one to watch. I’d played the game before, so I had a pretty clear sense at all points of what the correct next step was, but I restrained myself from providing that info. It’s much more satisfying and empowering, not to mention a better lesson and a better mental exercise, for him to solve it himself. He even figured out the game’s final puzzle way faster than I did when I played for the first time! A couple of years ago, Dante decided he wanted to learn more about computer programming. Now, when I learned to program, it was in BASIC, with a bit of Logo thrown in for good measure. But I guessed that in our brave new century, there are better alternatives available, and a bit of googling showed me that I was right. We found and downloaded a programming language called Scratch. Scratch was created by a group at the MIT Media Lab, with the intention of making a programming language for kids that would eliminate the frustrating syntax and compilation errors that can afflict new programmers. They did this by using a “block programming” paradigm — rather than typing in commands, the Scratch programmer drags prefabricated command blocks from a staging area into a kind of “code corral” associated with a particular sprite (graphical image). Blocks can grow or shrink as needed, so you can drag new stuff into your code block and it will automatically accommodate whatever it needs to. Everything is graphical, mouse-oriented, and intuitive. It’s quite cool. It also helps that the Scratch logo, and default sprite, is a kitty. Within a few hours, 7-year-old Dante was making that kitty run around, meow, and respond to keyboard commands. Dante’s interest in things tends to ebb and flow, and Scratch is no different. He would lay it aside for a few months, then return to it for a few days with new ideas for stuff to try, or just new motivation to poke around some more. At one point, Laura brought home a cool book from the library that rekindled his interest for a longer period. We even did a bit of Python programming over the summer, thanks to a different cool book. Well, Scratch has enjoyed a big renaissance this fall, and this time we have Stargate to thank. Dante read the book Flipped in his literacy class, and was assigned a presentation project, to demonstrate his knowledge of the first half of the book. The teacher allowed a lot of latitude for the format of this presentation, so when Dante proposed making it in Scratch, she signed off. He ended up doing two different Scratch presentations on Flipped, one for each half of the book. These presentations featured stick figures, animation, dialogue, drawings done with a mouse, and adorability. A few weeks later, he was assigned a larger project as a part of his social studies curriculum. They’re studying Colorado history this year, and the kids were to make a diorama depicting some early historical period of their choosing. The rubric for the assignment included showing people doing an activity, animals, plants, housing, tools, and so forth. As it happens, his literacy teacher is also his social studies teacher, which perhaps paved the way for him to propose doing a Scratch diorama instead. The teacher agreed, so he created a project called “archaic colorado” (capitalization is his arch-nemesis) in Scratch.